After acquiring my new loom, the last thing I wanted was for it to, well, loom, sad and unused in the corner of the room, so I threw myself into the business of learning to weave. I watched all the YouTube tutorials I could bear, and finding the general quality to be pretty poor, I concluded that it was worth paying the professionals, so signed up for Angela Tong’s Rigid Heddle class on Craftsy, which was on offer for a very reasonable £14. I loved this course – Tong is a knitwear designer and so approaches weaving from the same perspective as me. 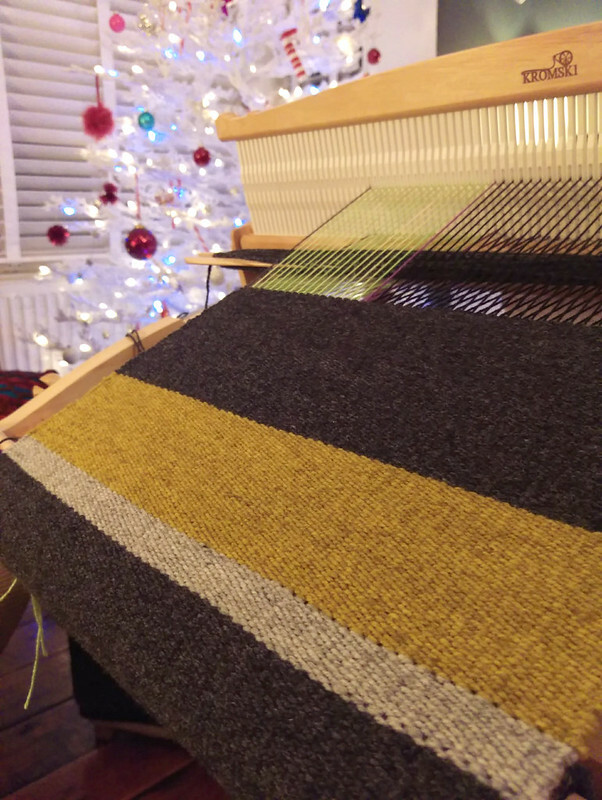 There are two projects in the course which teach the fundamentals of rigid heddle weaving, and although I didn’t follow either project I learned everything I needed to know to launch off on my own. Tong is an engaging and enthusiastic presenter and I loved the show and tell of her own creations (also the cameo from Stefanie Japel!). Online courses are great, but there’s nothing quite like having a printed reference, so I also got a copy of Inventive Weaving on a Little Loom by Syne Mitchell. This book is loved by many, and I had high hopes that it would give me some project ideas to complement what I’d learned already, but I have to say that I did not get on with it at all. I found the text overly verbose and many of the instructions confusing, and lacking photos of important stages, while going completely overboard in illustrating things that are very simple. The book is full of beautiful examples of weaving with no information about how they’ve been created. There is a large section of projects, but unfortunately they’re not my taste at all. 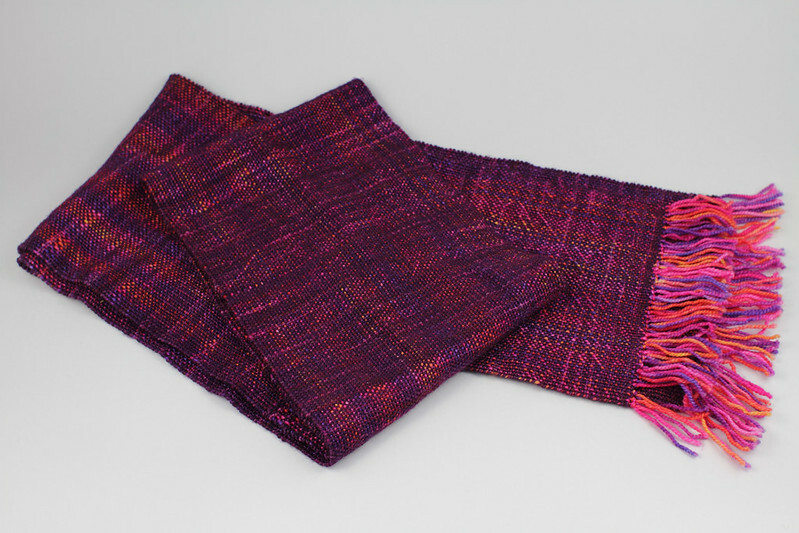 There was one project that caught my eye – a scarf with variegated yarn on the warp – which my project #2 was based on, although it worked more by accident than by design. I also found the lack of internationalisation very frustrating, and anyone else who works in metric will no-doubt find the same, I really wish that publishers would consider this. I’m the kind of person that learns best by just getting on and doing it, so that’s exactly what I did. I set myself a goal of making mum Mum a scarf for Christmas. Before one can weave, one must warp. This is the process of threading up the loom with the strands of yarn that run the length of the fabric. Following Angela Tong’s step-by-step instructions, I calculated the length and number of ends I’d need for my warp for a big wide scarf. 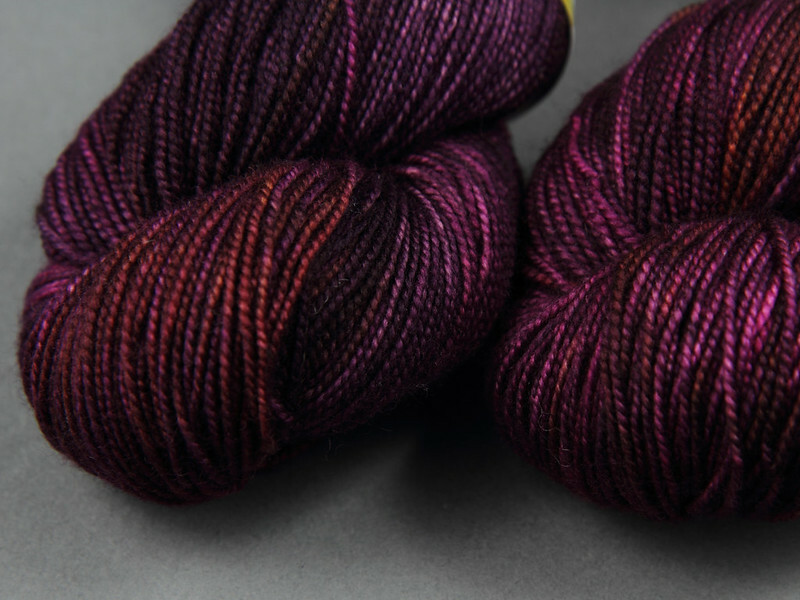 For this project I bought De Rarum Natura’s Ulysse from Wild and Woolly – this is a gorgeously soft woollen-spun yarn made from European Alpine merino that I had been hoping to try for some time, which hovers somewhere between 4 ply and DK due to its lofty nature. Heeding Tong’s advice, I decided the Ulysse wasn’t strong enough for warp, so I instead pulled some 4 ply silk blends from my stash (silk being very strong), including some leftover Brilliance 4 Ply in Uranium (bright green). I direct-warped using the peg clamped to my dining table, following Tong’s instructions, which was a fairly straightforward process (I don’t remember swearing). There’s no getting away from it, warping is slow, but once it’s done that’s half the project complete! Weaving went smoothly and grew quickly. I alternated between three colours trying various stripe patterns. The main thing that sets an experienced weaver apart from a notice is the neatness of their edges. Mine were far from perfect, but I don’t think they were bad enough to retract from the beauty of the fabric. The thing I didn’t predict was how little of the warp was visible. One of the big questions I had about weaving was “which heddle should I use for which weight of yarn”, hoping that the Inventive Weaving… book would answer for me (it didn’t). The 8dpi was too wide for the warp I chose (but would have probably been about right for my weft yarn). Nevertheless the project went off without a hitch and was finished in plenty of time for Christmas. The fabric is incredibly warm but also has a surprising amount of drape thanks to the silky warp. So there’s a lot of talk about you can and can’t use for warp, often stated that if you can snap a yarn with your hands it’s not strong enough. Having completed my first project I thought I’d test this theory and weave a scarf entirely in Favourite Sock. Being a pure merino yarn, and merino having relatively fine, short fibres, it can be snapped by pulling, but it’s has a strength that comes from being spun with a high twist, and my gut feeling was that it would hold up fine on the loom. After going through many, many combinations I kept coming back to the same one: bold and brash, variegated ‘Reaction‘ for the warp, and deep purple ‘Dancing in the Dark‘ for the weft. 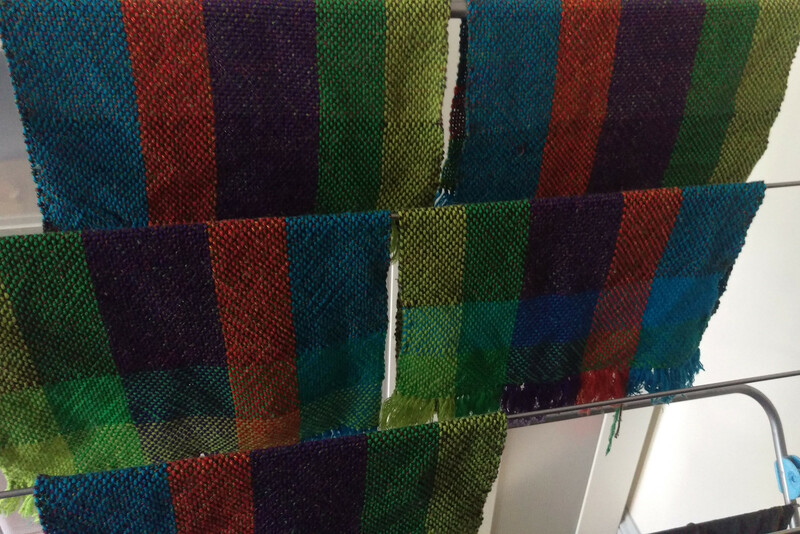 As mentioned, Inventive Weaving describes achieving colour pooling using variegated yarn on the warp, by measuring the warp to be an exact multiple of the skein circumference. You can find many beautiful examples of this technique on Ravelry. This is particularly effective when the pooling shifts every few cm, an effect created by cutting and repositioning the warp, and this is what I tried to achieve. In reality I found that as hard as I tried, I had very little control over where the colours fell, and I couldn’t measure the warp to be an accurate measure of the skein circumference because this yarn is, by nature, so springy (one of the things that makes it so nice to knit with). So I just warped as best as I could and by some miracle, the striped warp pooling happened all by itself. This was my second attempt and I used the warp board on the back of the loom. My first attempt was an experience I would rather forget but for the sake of others not repeating my mistakes: I was direct warping with the warp peg on the back of a chair, rather than the nice heavy table, in an attempt to have it be a specific length. The chair kept slipping, the peg was leaning at an angle, the additional tension caused by the springiness of the yarn eventually caused the peg to pop out of the clamp and the warp spring back creating a tangled mess at the heddle that had to be cut off. Half a skein of beautiful yarn went in the bin. Swearing index: 100. 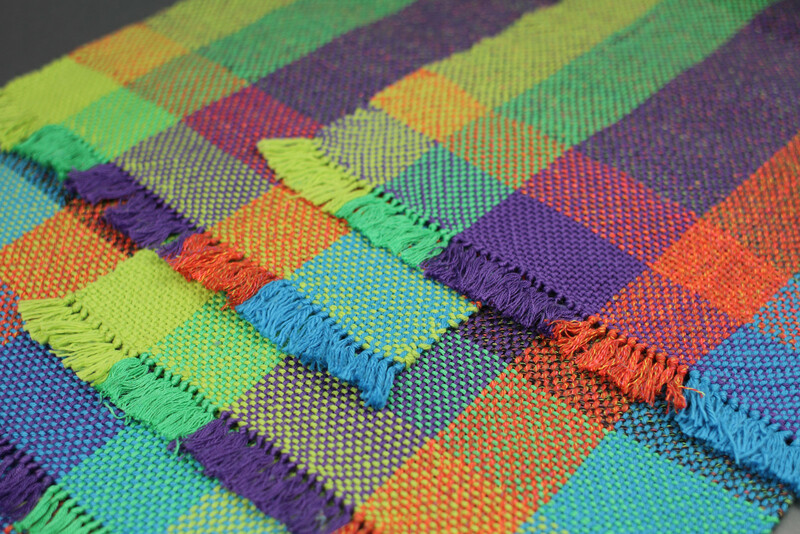 Once all set up, weaving was, again, very quick and easy! The fabric looked a little thin under tension, but once off the loom it settled and plumped up beautifully. 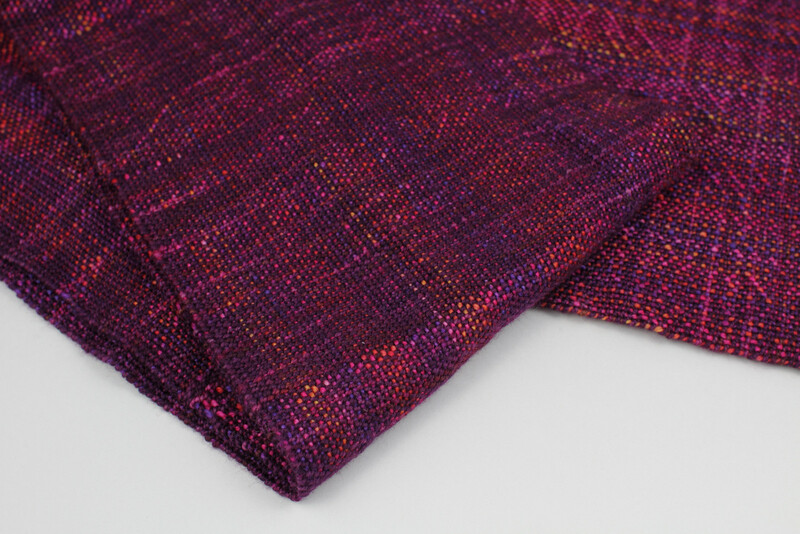 Although the warp is visible it is still weft dominant, which is a shame because the pooling doesn’t really come through, but it has instead a stunning, iridescent quality. I love this project. I thought I’d step out of my comfort zone and work with a material I don’t normally use. I dislike knitting with cotton because I find it so inflexible and stringy, but given my experience on project #2 it struck me that these properties might make it ideally suited to weaving. I also wanted to experiment a bit more with colour using stripes in both warp and weft. I ordered a few different yarns to get the colours I wanted and also used some with my stash. 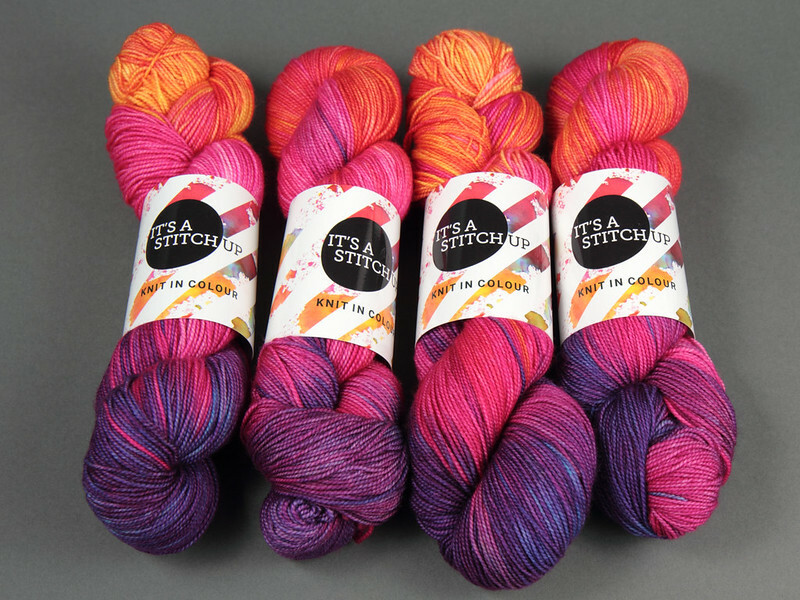 These were: Paintbox Yarns Cotton DK – a cheap and cheerful yarn available in over 50 colours; Rico Essentials Cotton DK – a great value mercerised cotton; Rico Fashion Pixel DK – a cotton/polyester blend with unusual brightly-coloured flecks. I calculated that I needed over 4m of warp for six good-sized placemats so I used the warp board, and I had to make it in two sections because the 120 ends of DK yarn wouldn’t fit on the pegs. 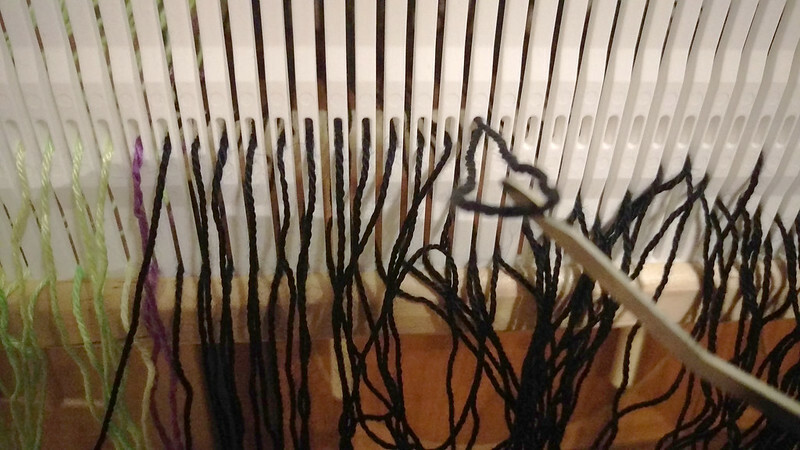 I also discovered the hard way that there is a downside to having an integrated warp board on the back of the Kromski Harp, which is a folding loom – quite a lot of tension builds up on the pegs, which resulted in the loom attempting to collapse itself when one of the catches came undone. None of this was anything like as traumatic as warping project #2, there was only moderate swearing and one more lesson was learned. 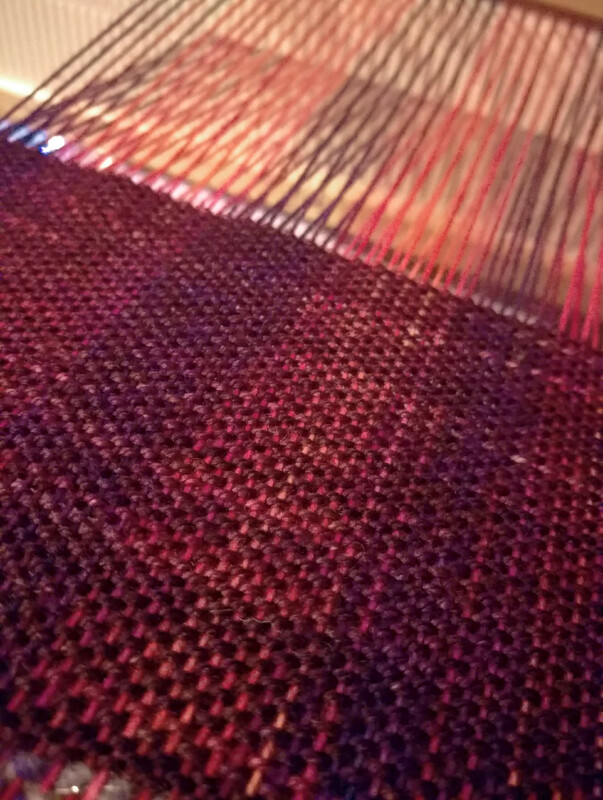 Determined to see the lovely colours I’d put on the warp, I used a 10 dpi heddle. The result was slight warp dominance this time, but not far off being balanced. To form the individual placemats I worked 10cm with scrap yarn between each one. 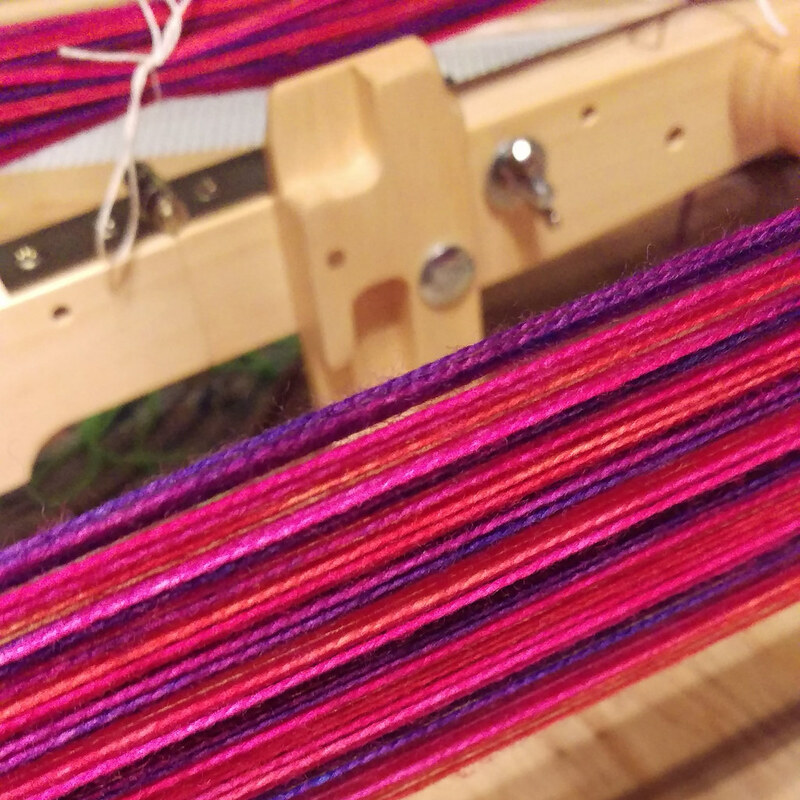 The weaving was mostly plain sailing but I had a bit of a disaster towards the end – my warp snapped when a knot got caught on the heddle. I tied on a new strand, tied a weight to it and sling it over the warp beam with minimal swearing. This worked fine… until another strand snapped, then another. I decided to abandon the sixth placemat and call it a set of four with a spare. Both the Paintbox and the Rico Essentials cotton were full of knots, and knots and not the weaver’s friend. Finishing was also a little tricky. 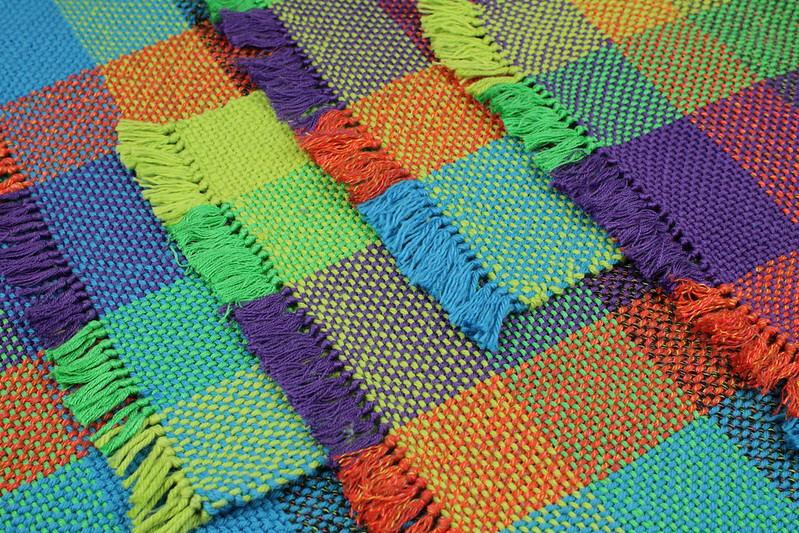 I gave the placemats a delicate 30°C wash before tying the fringes, which brought out each yarn’s unique characteristics in a way that had not been evident while weaving.Unfortunately the Paintbox cotton became quite matted (it claims to be machine washable but I’d take that with a pinch of salt). The silky Rico Essentials cotton started to unweave itself at the edges. Only the Fashion Pixel behaved itself, and I think would stand up well to repeated washing. The fringes themselves required over 500 knots, this is not an experience I care to repeat. My next set of placemats will definitely be overlocked and finished with binding tape. I deliberately chose bright colours that wouldn’t normally be used together: orange, lime, purple, turquoise and emerald. 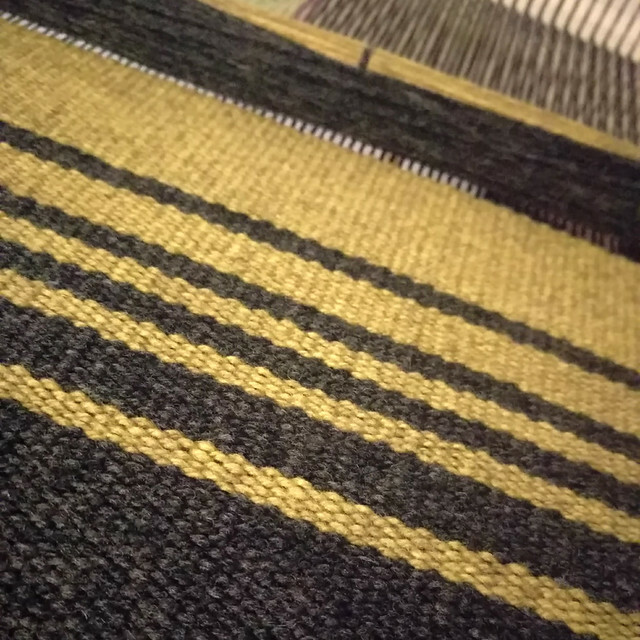 Each placemat has a different combination of bright colour stripes at one end before the weft moves into flecked black and grey Fashion Pixel yarn. The finished result is exactly what I had hoped for. Despite not really knowing what I’m doing, not planning meticulously and several things going wrong, I have three FOs that I’m really happy with. I have also learned heaps, which will enable me to make different mistakes next time. There is a very steep learning curve to weaving, the most difficult and fiddly part being warping, which is unfortunate because one can’t do very much weaving without a warp. 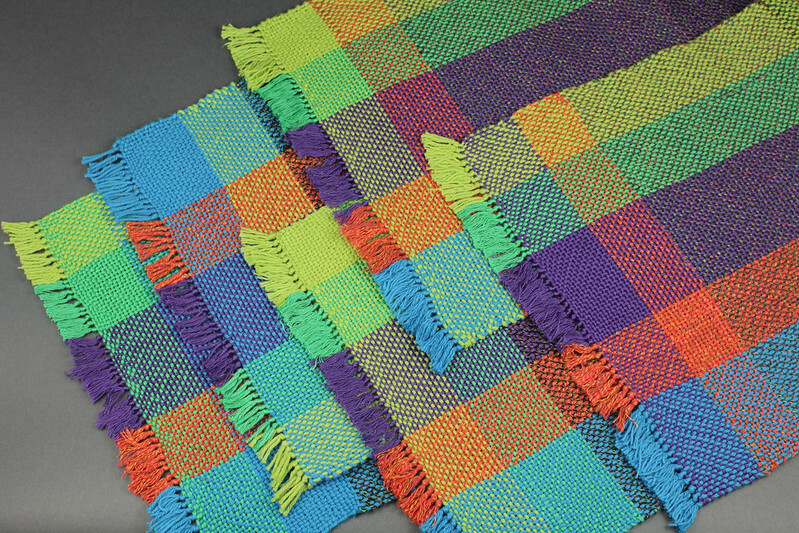 But once it’s on, weaving is very quick and straightforward. Being experienced in working with yarn is a big advantage in weaving. I think most knitters will intuitively know what will work and what won’t, and are likely to have a lot of success as beginners. 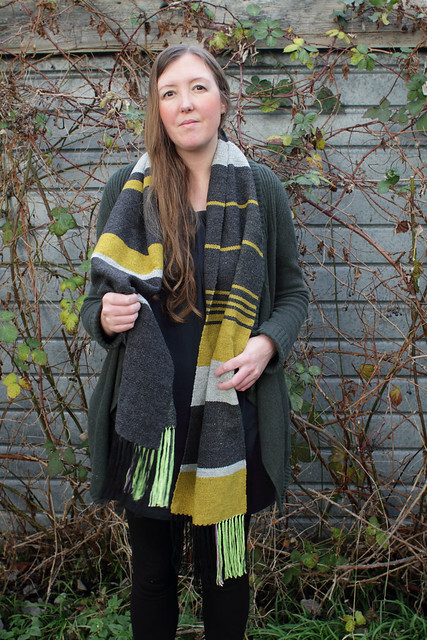 Blog New FO: Blend In, Stand Out fade shawl – see it in person! You might like to try hemstitching the hems instead next time – it’s usually described in weaving books for larger looms, if it isn’t in any of yours. Try your library, or I think it’s usually described in the back of every issue of Handwoven magazine. Much easier than tying all those knots, and you still get the lovely fringe. It’s done while still on the loom. Thank you Anne, that is something I have been meaning to try, I don’t know why I didn’t think of it! !